What it’s like to be an entrepreneur and a serious traveler at the same time. Being both an entrepreneur and a travel addict has never been easy. There is really no excuse to be tied to a desk anymore like ‘back in the day’ (which really wasn’t that long ago). Just look at digital nomads, the rising number of people who use technology to work remotely and live a free-spirited lifestyle. It’s the rise of what is being called the “traveling entrepreneur” – people who are making their businesses location independent and manageable from anywhere in the world, whether it’s the beach or an internet cafe. I would call myself one of the original digital nomads. In 1999, I went overseas with an open mind of whatever would happen, just would. So I set out to build a life that wouldn’t ever leave me feeling stagnant in one place again. It was a lot different back then, as there weren’t many of us on the frontlines of the digital age. I would say I had to stick my neck out a lot more and take some bigger risks to succeed. But I’m happy I did it, because living and building businesses in many different countries taught me how to follow my gut instinct. I always had to have a vision, and know exactly how I was going to see it through. Otherwise, I would’ve just fell flat on my face. I think that being part of that vanguard period was ultimately a good thing. These days, a lot of people are setting out to become digital nomads. But the truth is, while they accomplish a free-spirited lifestyle, they end up losing sight of long-term goals and end up floating around. That’s why being an entrepreneur and a traveler isn’t really two separate entities but rather single, distinct characteristic of achieving success. Let me give you an example. When I travel to a new country, I’m not interested in tourist attractions. I’m interested in people. I’m combing through Twitter to find out the entrepreneurial landscape: finding out who are the big wigs, who are the dreamers behind new startups, who’s influential on social media. Okay, so how can I meet them as quickly as possible? I’m looking to make contacts, serious contacts, as they are really the starting point of a much bigger picture: the beauty of a digital world is… anything is possible. That’s the big difference between a digital nomad and a real, serious traveling entrepreneur. I’m not stowed away on a beach somewhere, disconnected and only talking to people through e-mail. I’m making real, tangible connections. If I really like the beach, I’m going to find a way to be there more often: that starts with networking and creating opportunities both online and offline. The best (and most recent) example I can give you is what’s happening in Portugal where I recently moved. Through just a few tweets I made some very important business connections in my new (short-term) home of Lisbon. Not to mention these guys are now also my good friends. Read that blog “It all started with a single tweet” here. One of my favorite sayings is this ‘Traveling is like gasoline for entrepreneurs.’ I really believe that is true, the friends that you make, the new cultures you experience, it all feeds (in a big way) into your creativity and mindset. But I’m interested to hear what you have to say. Is it enough to be a digital nomad, or should there always be an endgame to the lifestyle? 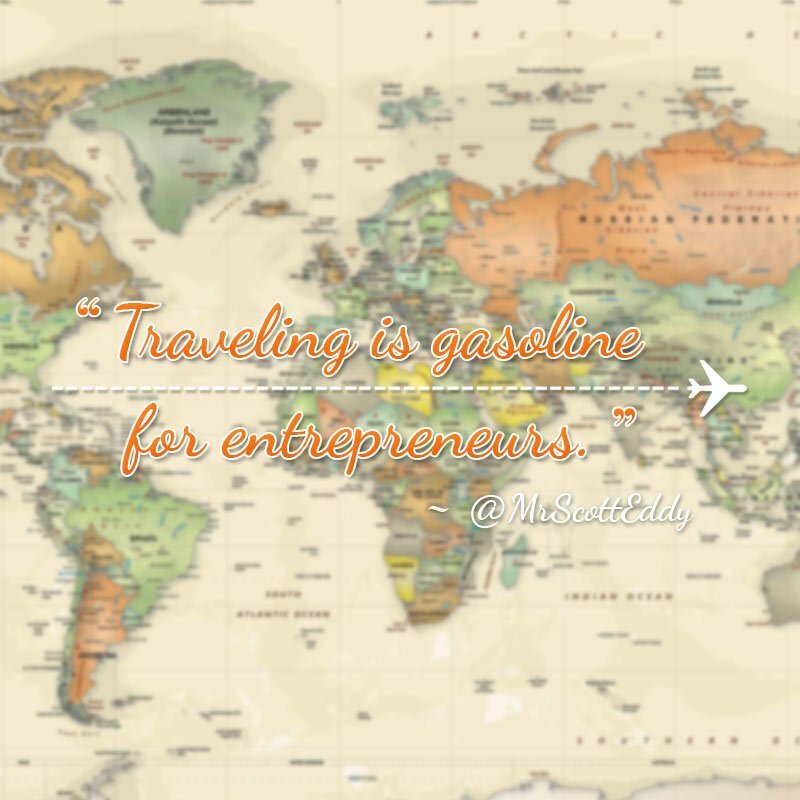 What do you think it means to be a traveling entrepreneur? Thank you for writing this article, honest and inspiring. It makes people like me feels more assuring that we are heading in the right direction; continuing to travel, learn and grow from places and people of different cultures and backgrounds. And one day all of that will come together….from initially nothing. I think most people like the idea of being a traveling entrepreneur. But not many will take the risk. Looking forward to your next article. @Nhien Thanks for your comment, I try to be as real as possible in all my posts. Travel if you love it (and I do), and you’ll realise that there are more important things than making money. If you have enough to live on, plenty to eat, a roof over your head, and people who love you – then you are truly rich. If you need to define yourself as an entrepreneur to do that – so be it. Loved this sentiment: “I have seen the worse times a lot more than I have seen the good times, BUT, I wouldn’t have it any other way”. Soo damn true! @Matt Thanks for your comment Matt!!! Great post. Love the quote. In our opinion and experience so far, it is not necessary to be a nomad to be a travel entrepreneur. You are so right about the personal connections that enrich the travel experience. Well said! One of the things we love about the community we are finding is that the world is filled (literally) with people passionate about travel and gifted at sharing their discoveries through social media. Travel then becomes a combination of real, physical, in-person experiences and inspiration from real experiences others share in their blogs. It’s a whole new way to travel digitally, which helps people make smarter decisions about how they spend their time and money when they venture forth on their own. Parents tied to a school schedule must be particularly discerning about allocating time and money when it comes to travel. Your post helps highlight the risks (and rewards) of attempting to turn a passion for travel into an actual revenue-generating business. We have embarked on this adventure this summer. Stay tuned to see if it works. Your post provides a good set of guideposts. Hopefully, our new and growing online travel friends will help us announce one day that we are “travel entrepreneurs” under your definition as well as ours. @Kate and Mike I love when like-minded people read my posts, I really appreciate your comments!! The problem I have with ‘location independent’ is that you never really find out the truth. 99% of content from digital nomads is positive. I’m going to be spending six months travelling and also try to build a business, it’ll be interesting to see what experiences I have. P.s. it’s a shame you don’t have the ‘website’ field on your comments form, it would be good to know more about the people commenting on your blog. @Darren That’s a good idea, I will see if I can add that. As for the truth, there is a lot of negative associated with this lifestyle, as there is with anyone’s life, and I can’t speak for anyone else, but with me, I try to give both sides with an emphasis on the positive. But yeah, I agree, its good to share the bad side as well, that’s how you will learn. Great blog and very inspirational. My cofounder and I are travel addicts and have created mobile apps that allow us to work from anywhere. The bonus perk is that we created a way for travelers to receive calls using their own cell number anywhere in the world over WiFi or 3G and call back home using their own caller ID. That way, just like us the travelers can be location independent and never have to tell anyone that they left the country since the calls come through their cell number anywhere in the world without any outrageous roaming bills. Check us out at youroam.com for iOS and Android. @Marcos Thanks, I will check it out. Great post. I especially think it’s important to travel if you are from a small country. I’m a Jamaican discovering that I can only develop my country if I grow through travelling. I will be in Spain early next year and contemplating Portugal. If we are both there then, I will be sure to reach out. A very encouraging post! I come from a small country too – Singapore, where lifestyle here is usually associated with the words Safe, Secured, Stability, and Clean. I find that I discover so much more about myself as a person through traveling and working on a startup recently. I love your quote “I am addicted to creating ‘something’ out of ‘nothing.””, absolutely agree! Your post has a lot of great pointers for me, thank you. @Joan Thanks so much for your comments, much appreciated. Addicted to creating something out of nothing in my opinion is the key to being able to call yourself a true entrepreneur! I liked your story as it is almost the same as mine. I have failed more times than suceeded but I never give up and after loing millions and a near death experience in 2005 in LA, I am now back at the top of a new ladder having created an ingenius product. Finding a gap in the market or creating a must have product everyone needs, is all about searching and travel gives you more scope and more waysto help stimulate creative thoughts and come up with the gem you need to succeed. @Shirley Sounds amazing, feel free to email me to tell me about your product scott@mrscotteddy.com. Good luck with everything!!! I appreciate the comments. thanks Scott- it certainly is nice to be reminded to keep chipping away at a project that has such an unknown future. My experience as an Australian living in the French alps has led me to build Chaletguardian. As a chalet host I noticed normally there is no link between owners and people like me who are willing to do almost anything to live in these beautiful ski towns. So, I’m creating a profile based site to make that connection more accessible. The best part is that I return to host the chalet this winter now with my own purpose to be there. A digital nomad. I like it! @Ashley Thanks for your comments, sounds like a great idea, good luck! I think that there should only be an end game if you want there to be an end. If that’s the case then you should impliment it in to your long term business goal. Thanks for the info Scott. I can’t wait to read the next one. @One Modern Couple Thanks for your comments!! Loved the article. I am in the process of converting my business to a digital business so I can travel more and work from anywhere. Thanks for validating the fact that this is achievable. @Michele Thanks for your comment, good luck with your business!!! Avid traveler, perpetual entrepreneur, king of social media. A once Wall Street stock broker turned digital "go-to" guy for the travel industry. Mr. Eddy spends his days globe trotting in luxury, networking with like minded individuals and sipping the best champagne. Follow along as he takes an audience of over 1.5 million followers around the world.